Fair warning. This post is going to be pretty cut and dry. No funnies. No fluff. If I took as long as I usually do to describe the events that have transpired you would be reading for a very long time. More importantly… I’d be typing and typing and typing forrrr evvvvveeeeeerrrrrr. Now that that’s out of the way. Let’s begin! Doctor! I need a doctor, the patient is not breathing! Alright, so here we are again. 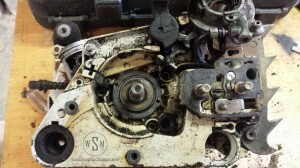 The saw didn’t do any better after the carburetor rebuild so onto further work. When I was given this saw, I was told that it was low on compression. Time to tear ‘er down and rebuild the top end. 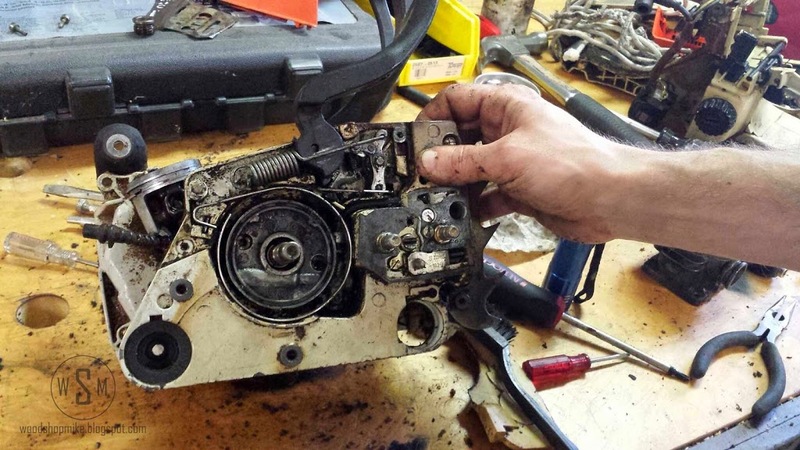 Start by removing the bar, air filter cover, starter, and engine cover. Time to pull out the spark plug. I occasionally forget that the chainsaw wrench also fits the spark plug and end up fumbling through my socket set to get the spark plug socket. Don’t be like me and remember to just use your chainsaw wrench! To begin, stuff a cord into the spark plug hole. This will bind the piston and allow to you to remove the flywheel. Here’s a tip. Break the nut free and unthread it just until the nut is sitting proud. 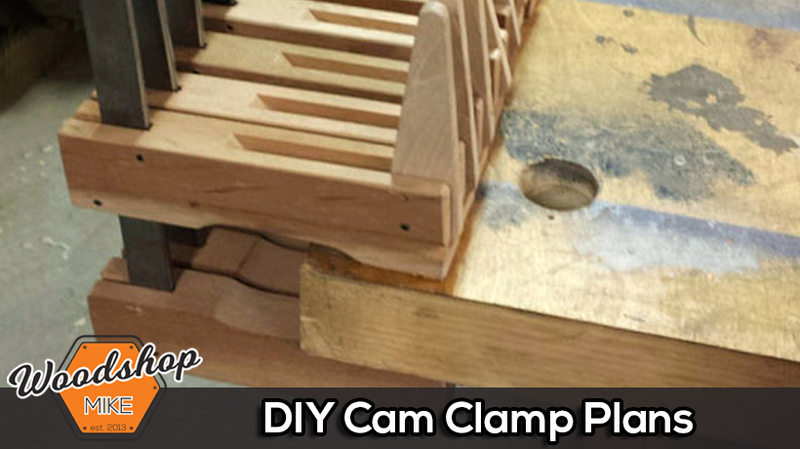 Grab a piece of mild steel or brass and set it on the nut. Then give it a solid smack with a hammer. The softer material is used so that you don’t damage the nut. Hahaha, smack a nut. Hilarious! The flywheel mates onto a tapered shaft. I had to squirt a little penetrating oil on this a let it soak for about 10 minutes before it could be persuaded to move. Here’s a little tip for ya: When you remove the fly wheel, have the magnetic side facing away from the magneto. The magneto is the black block with a wire going to it located at about 4 o’clock relative to the fly wheel. Also, I removed the magneto at this point, but only to clean behind it. At a minimum, you need to disconnect the wires that are attached to it so that you can remove the handle in a bit. 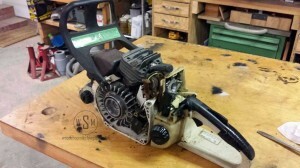 Flip over the saw and remove the clutch drum. Follow along with the photos and you’ll be just fine. 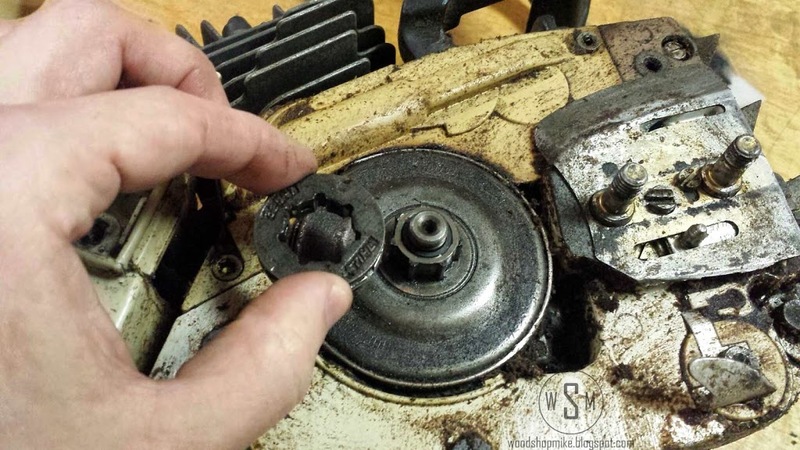 To remove the drum, don’t grab the sprocket with pliers! Just be patient and wiggle it loose. Next, we’re going to remove the handle. There are 3 screws to remove. They are located inside each of the rubber “AV” bumpers. One is at 1 o’clock above the flywheel. 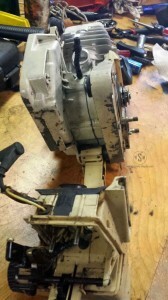 The other two screws are on the the opposite side of the saw along the bottom edge, inside each of the plastic “plugs.” One plug is located at the chain catcher, the other is at the far edge of the crank case. 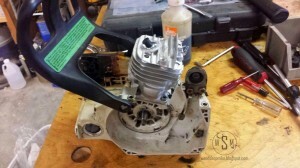 After removing the 4 torx screws out of cylinder, I lifted the cylinder away from the saw and quickly realized that I was on the right path to restoring power to this engine. 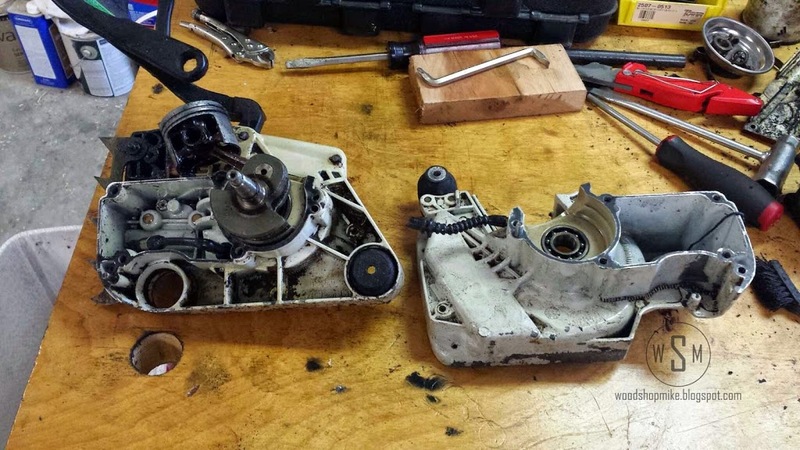 The piston was heavily scored and the piston rings were completely worn. The next step can probably be omitted, but I sometimes get a little particular about how clean things are. I figured that since I’m going through all of this work, I might as well get the saw as clean as possible while I’ve got it in pieces. I removed the cover that protects the chain brake springs. I cleaned out all this junk and removed the big coil spring along with the band that encircles the clutch drum. 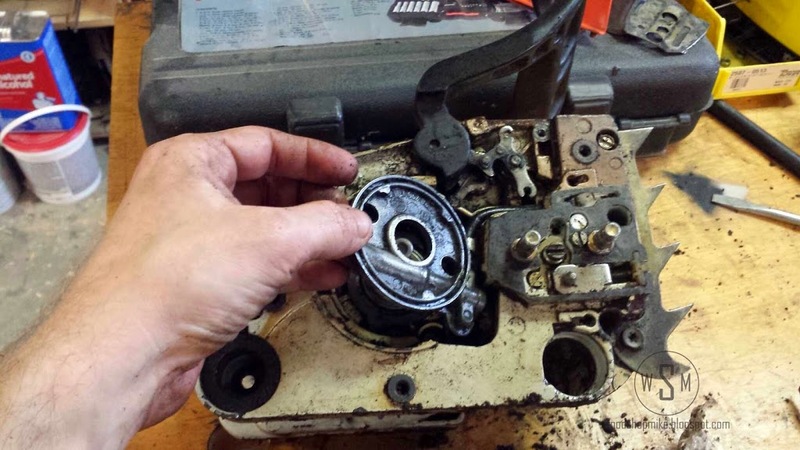 After cleaning and repositioning the oil pump, I was able to locate three screws that needed to be removed so that I could separate the crank case. These screws can be reached with the oil pump and springs in place. I simply couldn’t see them with all of the swarf that was packed in the saw. Now to separate the crank case. I don’t have a photo of my set up for splitting the case, so words will have to suffice. 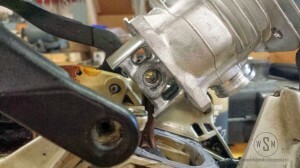 I used the corner of my workbench as the surface of contact in the area of the crankcase where the handle attaches. 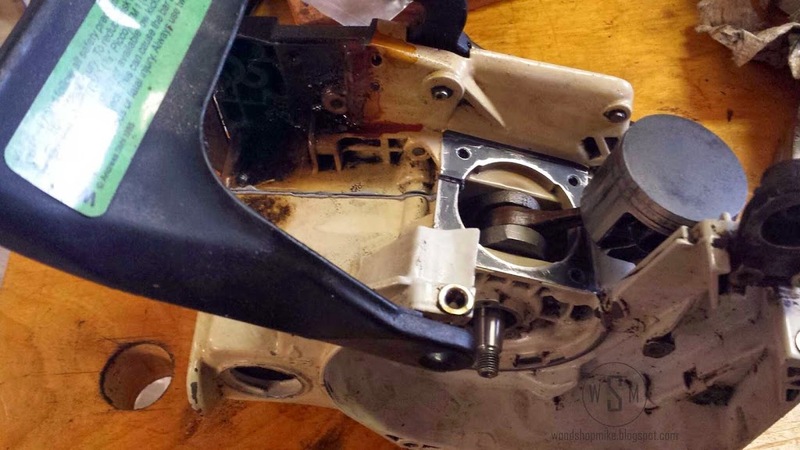 To further explain… Look at the bottom of the crankcase… See the area that is empty (where the handle usually lives)? 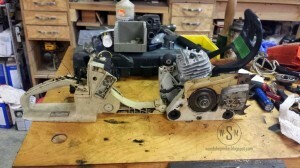 Slide the saw (flywheel facing up) against the bench so that this area is “filled” by the bench top and that the left side inside edge is sitting against the top of the bench. Whew, that was wordy. Get a hammer and gently begin tapping against the crank shaft from the flywheel side. Continue doing this until the case begins to open at the seam. Don’t expect or try to make the case come apart in 5 hits. You’ll probably break something. Once the case begins coming apart, gently use a screwdriver pry to case open. 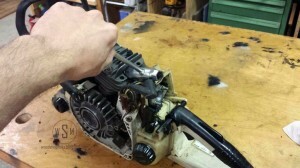 Here’s a tip for reassembly, wrap some sand paper around the locating pins and the bearing area of the crank shaft and sand them down ever so slightly. This will allow you to reassemble the case without needing so much force (which you won’t be able to evenly apply without a press). Once the case was apart, I went nuts trying to clean out every nook and cranny of this thing. 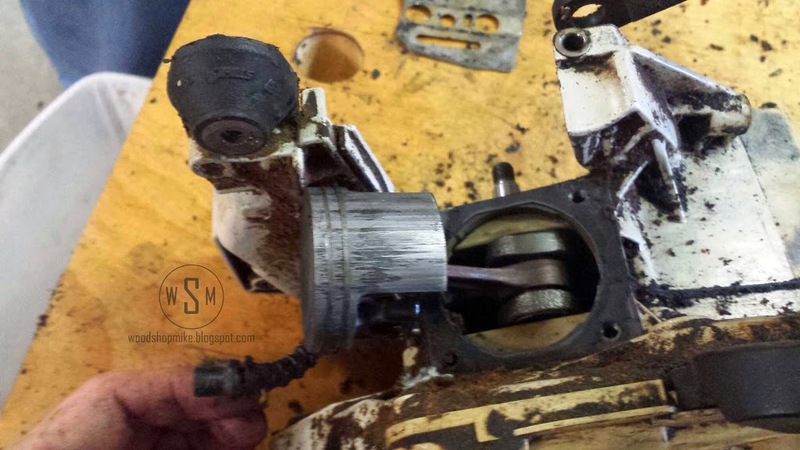 Honestly, the minimum that needs to be accomplished here is to keep debris out of the crank shaft area. If you’re wondering why I split the case to begin with, it was so that I could replace the main crank case gasket. 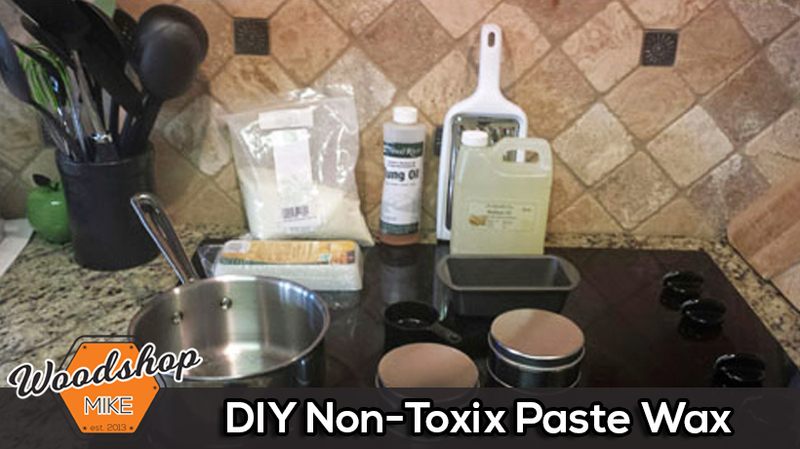 You will need to scrape off the old gasket and clean up the surface so that a new gasket can be installed. I ended up using a flat razor blade to scrape away the material. A word of caution, the crank case is aluminum and can easily be gouged by the razor blade. Take it nice and easy and you’ll be just fine. Once the old gasket and sealant is all cleaned off and you’ve sanded down the locating pins as I previously explained, you’re ready to reassemble. 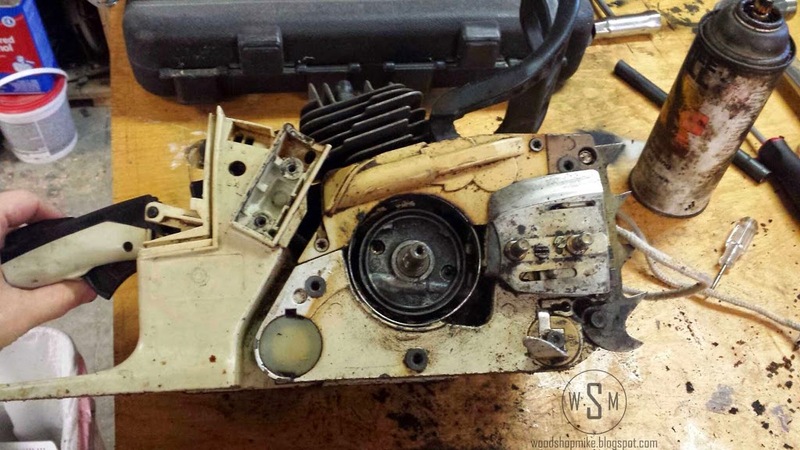 Give everything one last wipe down and inspect the gasket surfaces for any debris. All good? You’ll need to apply gasket sealant to each side of the case in an even and thin layer. I used Yamabond 4. 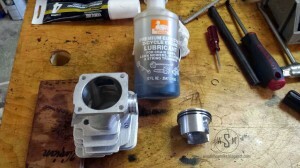 Then lay the gasket on the right half of the crank case. Now you’re ready to slap the two pieces together. Line up the two halves (right side against the bench) and use your hammer to begin tapping the assembly together. Start by hammering around the crank shaft area with light “circling” taps. Once the locating pins begin aligning with their respective holes, hammer directly above those areas. No need to get the entire case completely pressed together, you can finish closing it up with the crank case screws. Now that the case is back together, I’m going to remove the piston and install the new one. In hindsight, this would have been a little easier while the saw was still apart. No worries if you follow my process though. It was still pretty manageable. 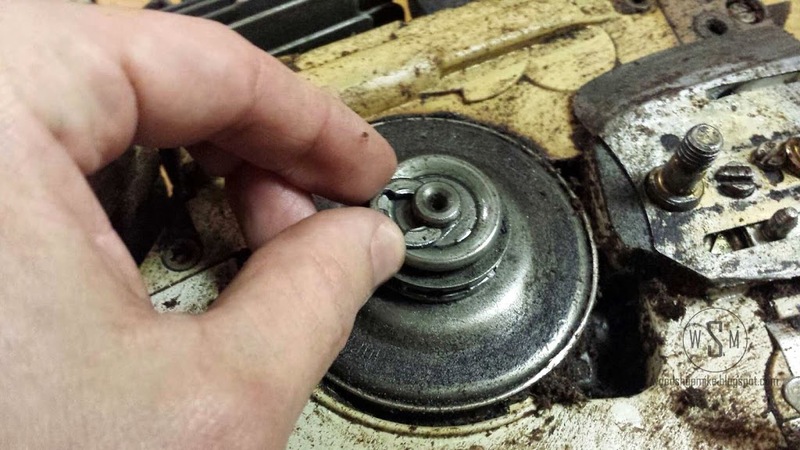 There are two cir clips that set in an internal groove on the piston where the linkage pin and roller bearing live. These are easier to remove than they are to replace. It’s a good idea to not lose these just in case you lose the new clips when you install the new piston. You only need to remove one clip to remove the linkage pin. Now push the pin in the direction of the missing cir clip. I used a screw driver that was just the right size! 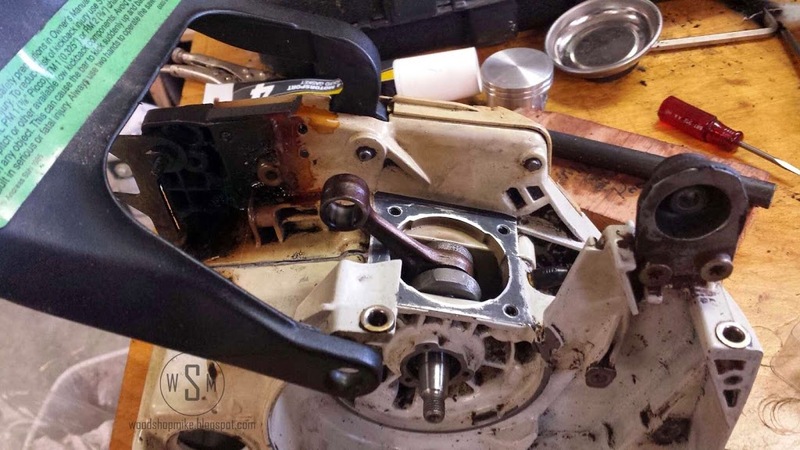 Once the piston is off, I scraped the surface smooth where the new gasket will live. Now I’ll move on to preparing the new piston assembly. I’ve laid out all of the components for the cylinder and piston. Here I have installed the piston rings. These are made of iron and can be easily broken if you’re hamfisted. There is a little split in each of the piston rings. Place the tip of your thumbs in this split and gently spread the ring open so that it will slide over the piston. Set the ring in the lower of the two grooves on the outside of the piston and align the split with the small pin in the groove. Repeat the above process with the remaining ring and place it in the upper groove on the piston. 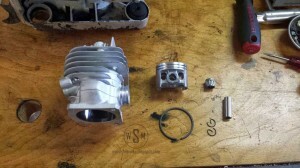 Once you are finished, your piston should look like the one in the photo below. You will probably notice that the rings seem to be very loose on the piston and maybe you’ll think they are even too big. Fear not, they are correct. The reason the rings seem oversized is so that they will compress in the piston ring groove and slide against the inside of the cylinder. Here’s how I set the piston into the cylinder. The first step is to lube up the cylinder. 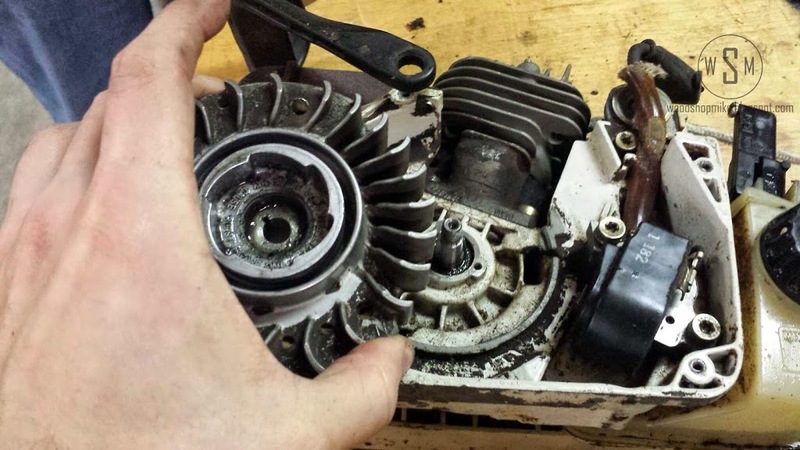 I used a heavy oil for 2 stroke motors. It’s 100:1 as compared to the usual 50:1 and worked great for this application. Why did I put oil on the cylinder? Lots of scoring can occur while an engine is being broken in because the rings and cylinder haven’t been coated with oil yet. Spreading a bit of this stuff inside the cylinder before I install the piston gives me a good chance of missing out on some of this premature engine wear. Ok ok, enough about that. Line up the piston so that the ring splits are facing away from the exhaust port (rectangular opening in cylinder). I did actually get a picture of this, so examine the photo if words don’t do it for you. You really don’t want to twist the piston once you have it seated in the cylinder, so get the alignment as close as possible before you push the piston in. I used two small screwdrivers to compress the piston rings evenly so that the piston drops into the cylinder. Take care to not scratch the rings. If you’d prefer, you can use something like a plastic toothpick. Repeat the process for the remaining ring and then you can move on to attaching the piston to the piston rod. In the photo below, I’ve applied the gasket sealant and installed the right side cir clip. 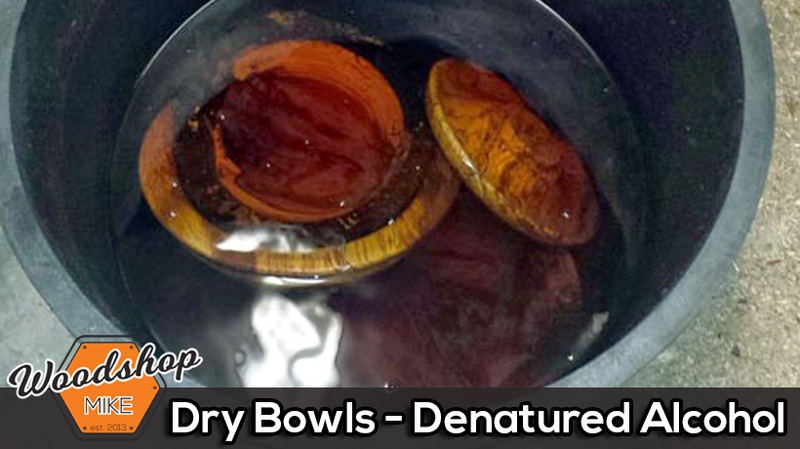 Try to not get the sealant too close to the inside edge of the cylinder. 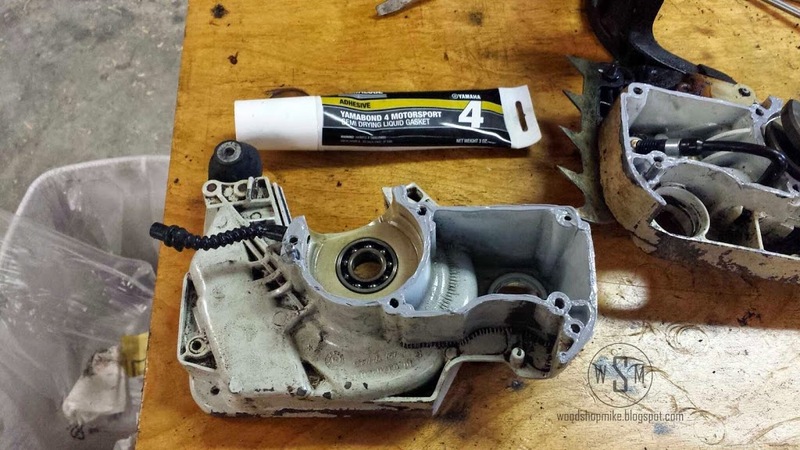 Before you get ahead of yourself, put the sealant and remaining gasket on the crank case. It should be located just below the cylinder head (where you removed the original gasket). 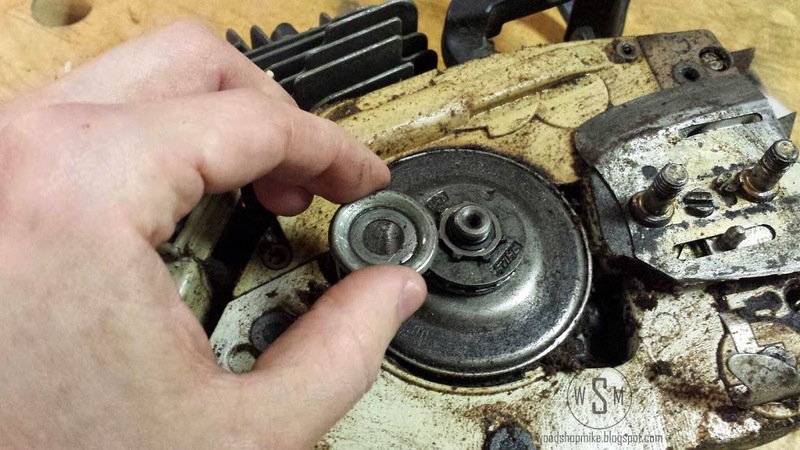 To link these two items, you need to put the roller bearing inside the hole of the piston rod. Then slide the piston and cylinder into place so that the inside of the roller bearing and the hole in the bottom of the piston line up. 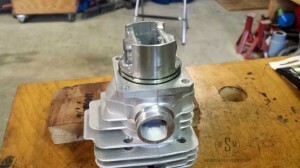 Once this is done, slide the linkage pin into place and pop the remaining cir clip into the piston. Congrats! That was kinda fiddly, huh? Now you’re ready to bolt down the cylinder head. Four torx screws are all you need. If things are going well for you, it should look kinda like this. Well, not you’re ready to put the handle back on. Really, this is just a matter of running some screws into place. The only difficult part of this was getting the impulse line back through the handle. Good luck with that actually…it was a pain. I only attached the screw in the handle that is closest to the exhaust port so that I had more maneuverability. I used needle nose pliers, hemostats, and a small screw driver to get this hose through the opening in the handle. There are a few other things that need to go back together before you’re done. One is the fly wheel and magneto. The fly wheel is pretty easy. It is keyed and sits on a tapered shaft, so just turn the flywheel until it drops into place and then tighten it down. What the whole crank shaft is just spinning? 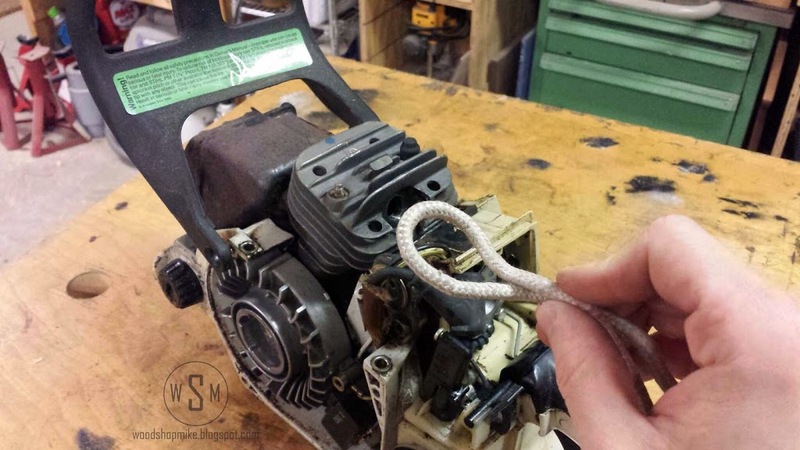 You’ll need to use your rope again and stuff it into the cylinder through the spark plug hole to bind the piston so that you can tighten down the fly wheel. Now reconnect the wires to the magneto and set it in place. Loosely run in the two torx screws and slide a business card between the flywheel and magneto. 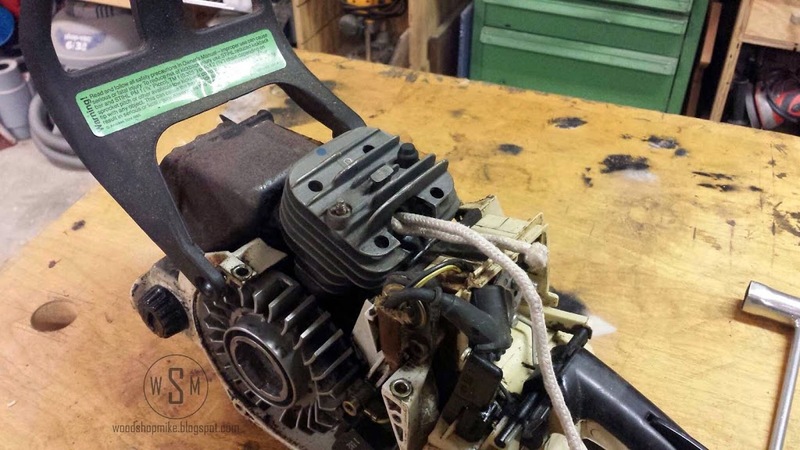 This will create a gap and insure that your ignition system is setup properly. Next is to put the springs in place for your chain brake. If you didn’t take these out, then skip ahead a bit. First, put the band that encircles the clutch drum in place. Then comes the tricky part, and I recommend safety glasses just in case. Hook the long non-coiled section of the spring into the rocker arm that’s in front of the chain brake lever. Now you need to hook the other end around a peg that is about an inch away. Grab a big flat head screw driver and wedge it between the coils about 3 wraps in from the end that you are working with. You have to angle the screw driver into the direction that you are pulling or the spring will slip right off. Good luck. If this method seems unsettling, then try using pliers. After than stuff is in place, put the cover for those springs back on and install the clutch drum in the reverse order you disassembled it. 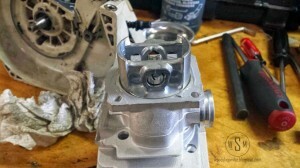 The only other thing to note is that if you are upgrading to a cylinder head that has a decompression valve, you’ll need to drill a hole in your top cover to allow access for the valve. You’ll have a hard time attaching the cover without this hole added. I just used a 3/4″ forstner bit in a hand drill. The other items that remain are covered in the carburetor rebuild. Well, aside from putting in the spark plug and adding gas… But you knew that of course! 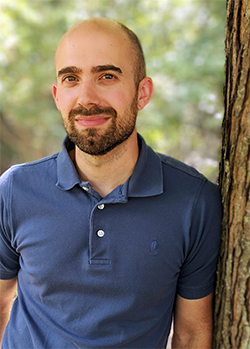 Best of luck, and I hope this information was helpful for you. Let me know if you have any questions or comments. If I missed something, call me out on it. 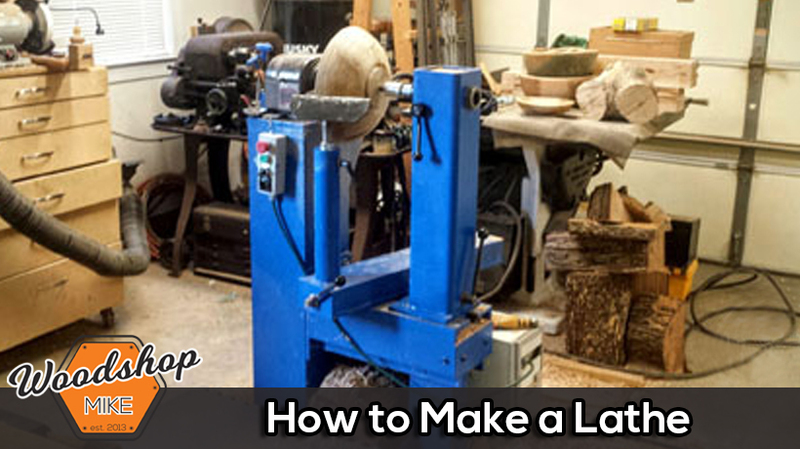 I don’t want someone learning from this tutorial and screwing up their saw! 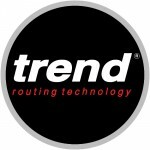 hi mike and kudos for your site. I would like to add that when any of the readers are fitting a replacement piston and rings to make sure the rings are fitted in accordance with the tiny dowels (taper bevel on the rings) located in the grooves otherwise it will be an effort to crank the saw as I have just discovered lol! 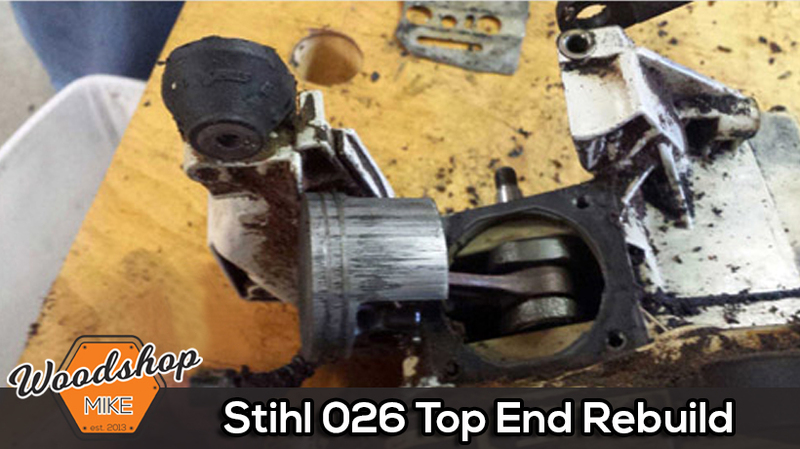 another stripdown required for the ms180. happy days! 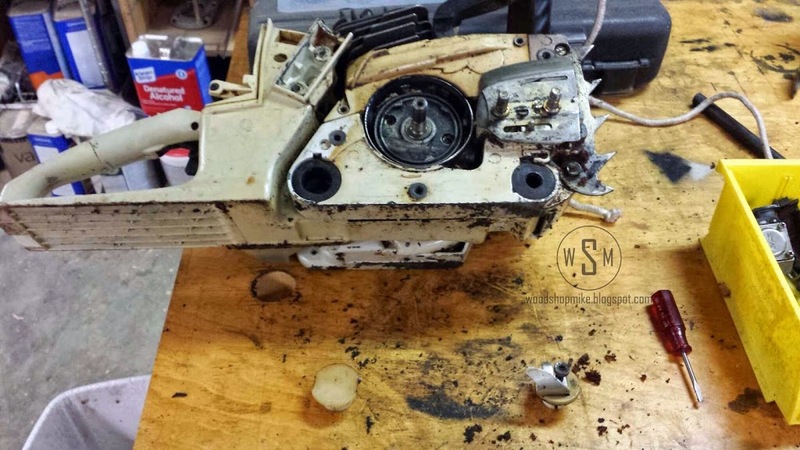 Thanks for the article, Mike… Made me excited about starting chainsaw projects! 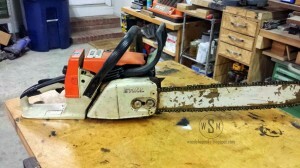 I’m good with basic maintenance, but new to bigger projects with saws. My first challenge is a still 034 av super that I’ve had sitting in the shop for a year. The saw starts, but will die if I let it idle. It ran well for half an hour while cutting then died and wouldn’t restart, until the next day. I’ve tried resetting the carb to factory settings, but no change. Chain is either moving or saw is dead. 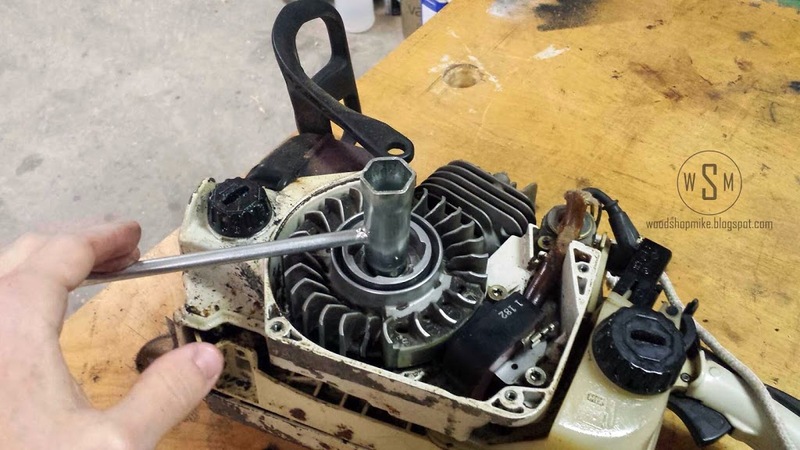 Do I need to replace the carb? Or get a tachometer and try to set the speeds properly? Not sure where to start. Anyways, your article was great, and no worries if you don’t feel like dissecting my issue…. I’m stoked to start learning on this one, and do a full rebuild like yours here one day! Thanks! 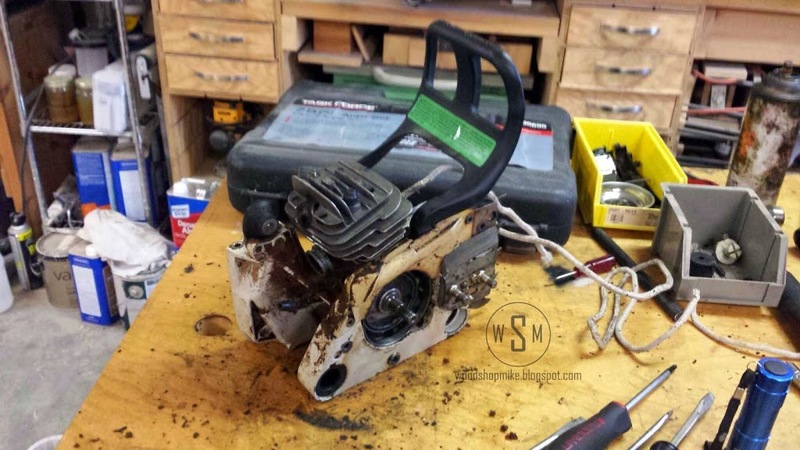 I’m really glad the article has inspired you to take on your own chainsaw rebuild! 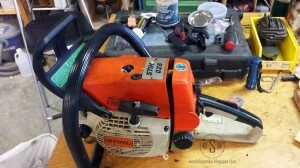 I had a similar thing going on with my husqvarna 394xp. I just replaced the fuel line and was good to go. If your saw also has an impulse line you’ll want to change that too. Awesome, thanks Mike, I’ll give that a try! !